Termites found during a building and pest inspection. This was a bit of a worry as these termites. (Schedorhinotermes) are amongst the most aggressive Australian Termites. It was noted this was a major colony because the presence of major and minor soldiers. What we mean by major and minor soldiers are there are small ones and large ones present. The prospective buyers decided this was too much of a risk and pulled out of the contract. 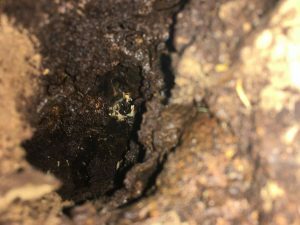 Termites Found In a tree during a Building and Pest inspection. The Termite Treatment used to the tree was to locate the nest and treat with TERMIDOR.we do this by drilling a hole into the tree then applying TERMIDOR. As you can see the termites are not doing to well . Hopefully the big old tree will survive. Termites Found with the TERMATRAC T3i. Also Termites detected inside the House using the Termatrac T3i. In fact it was the same termites that were found in the tree at the house. The treatment carried out was a foaming treatment to the internal wall cavities. Termidor foam was the go to for this treatment and we were confident it was working as you could hear them once the foam was applied. The sound you hear is like a clicking sound as they vibrate their heads to warn each other. They are telling each other that something is going on. The Video below shows termites found using the Termatrac T3i. The Termatrac is the best tool we have for finding Termites. We can actually tell by the movement on the termatrac sensor whether it is termites or something else. Also used when conditions permit is a thermal imaging camera . 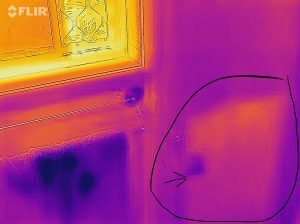 This is a thermal image of a termite sub nest in a wall cavity. The Termatrac T3i found the termite nest first then we used the Thermal camera. The Thermal Camera usually doesn't find anything apart from High moisture areas and occasionally electrical hot spots. 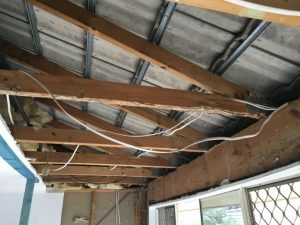 So if you are buying a new home or selling and want the most thorough Building and pest inspection in Brisbane , The Gold Coast or Ipswich and all surrounding areas. Give Vicki or Lauren a call on 07 32008586. They will walk you through the whole process so you can sit back and relax.